Linfield returned to the top of the Irish Premiership with a thumping 5-0 win over bottom-placed Warrenpoint Town. 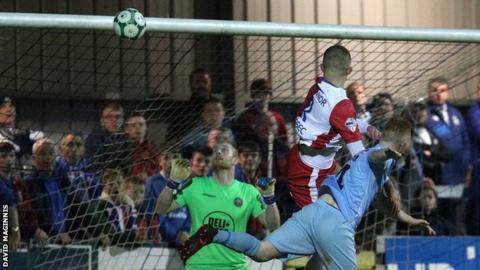 Debutant keeper Aaron McCarey was sent-off for Point, while Linfield secured their fifth clean sheet in six games. Ryan Curran's volley and a Joe Gormley double gave Cliftonville their first league win since the opening day of the season against Institute. Glentoran moved up to third with a 4-1 win over Newry City at the Oval. David Healy's Linfield were handed the early impetus at Milltown when Simon Kelly turned the ball into his own net inside three minutes. Summer signings Daniel Kearns and Michael O'Connor were on target before McCarey, who signed from Ross County on Wednesday, was given his marching orders after bringing down Joel Cooper. Andy Mitchell converted the spot-kick before Andrew Waterworth came off the bench to complete the scoring in the dying minutes. Cliftonville had only managed two points from their previous four games prior to Friday's game against Institute. The hosts produced a much-improved performance and came racing out of the traps to move into a two goal lead after just 10 minutes. Former Ballinamallard forward Curran pounced on a loose ball to open the scoring before last season's top scorer Gormley grabbed his fourth of the season from Jay Donnelly's pull-back. Cliftonville's marksman was on target again shortly after the break, heading in Jaimie McGovern's cross to secure a welcome three points for the north Belfast side. Glentoran now sit level on points with second-placed Coleraine, having played a game more, on 11 points. Ronnie McFall's side are undefeated since falling to a last-minute defeat against Cliftonville on 4 August. Strike duo Curtis Allen and Robbie McDaid continued their impressive early season form with a goal each in the first half before Conall Delaney pulled one back for the visitors. Marcus Kane restored Glentoran's two-goal advantage after the break before Dylan Davidson's spectacular long-range effort added an extra gloss to the result.